Taking modular buildings to new heights, 4More Space brings over 20 years of experience across the UK. One aspect of our service is upholding the strongest accreditation and professionalism from our crane suppliers. Holding them to the highest degree of inspection and providing audits on all companies reviewed, we ensure that they meet the needs of our clients. When lifting modular and portable buildings, we understand the importance of business ethics and adhere to what is written in the transport section. Among highly rated portable building companies, we understand the importance of a strong working relationship with qualified and dependable crane suppliers. We understand that our reputation as a company is dependent upon the services we can provide for you. That is why we go the extra mile to ensure that every aspect of our business, including our crane suppliers, is handled with the care and attention it requires. Regardless of your scale or ambition, 4More Space are the modular building contractors to address your needs. With rigorous quality control when manufacturing and refurbishing buildings, 4More Space understands the needs of developers and designers across the UK. We offer a full turnkey solution that includes not only information and supply of cranes, but of design, planning, groundwork, building control, installation, utility service connections, and more. We are with you from start to finish. 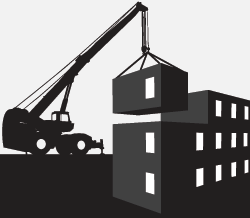 As one of the leading modular building companies, we provide a friendly and professional service that can answer any questions you have regarding our crane suppliers. Supplying you with new and used quality products, we are more than happy to answer any questions you may have. We understand that complications and challenges that can arise that is why we project manage all of our building installations. When lifting your Modular or Portable building, 4MoreSpace will ensure you receive a service from a crane supplier with an excellent track record and an enviable Health & Safety record. Call us now at 0870 803 1965 and learn for yourself what crane services we can provide.